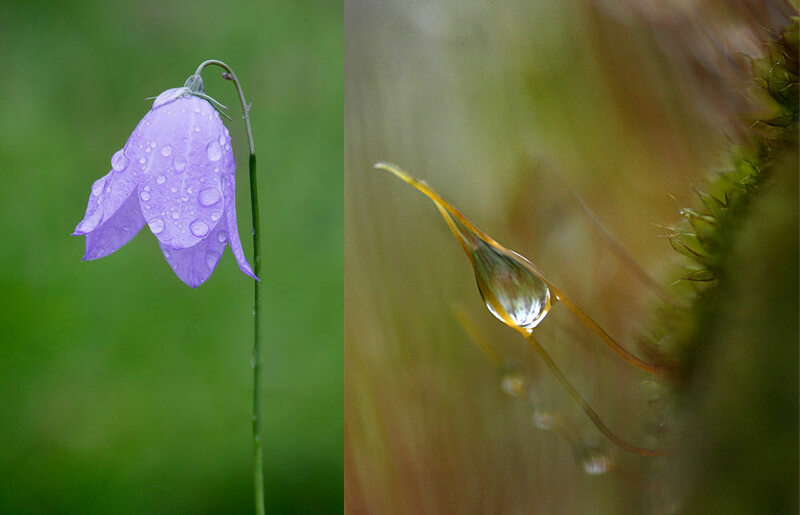 Get up early and explore your garden with your macro lens to capture interesting waterdrop images. When you look out of your window and you see your lawn covered in morning dew, sparkling in the sunlight you need to get out of your Pjs, pick up your camera and get outside to photograph it. If you can't face getting up quite so early you can try using a spray bottle on your plants and shrubbery as this will create the same kind of effect. You'll need a macro lens as you're going to be working at close focusing distances but if you're a compact user you should switch to macro mode (usually a flower symbol on your mode dial) to let your camera know you're going to be working close to your subject). If you have a tripod with a centre column that can be turned horizontally or upside down, set it up, otherwise you might find a bean bag more useful. If you have one, use a cable release or remote release as even the slightest touch on the camera can cause enough camera shake to blur your image. Alternatively, a two-second self-timer gives you enough time to press the button and let go or, if your camera supports it, use your Smart Device to trigger the shutter. A mid-range aperture will give you a decent depth of field, throwing the background out of focus while the subject stays ultra sharp. Keep an eye on your shutter speed as you don't want a blurry photo. Do try a larger aperture too but if you find it blurs more of the shot then you intended, just change the size. Make sure your focus is on the drop(s) so you get a nice clear shot of them. You may have to sacrifice foreground sharpness as a blurry drop will just distract the viewer. Dew drops falling down blades of grass look great but another cool and simple trick is to get an image inside the dew drop. To do this take another flower or grass blade and move it behind your subject until you can see it in your viewfinder. Do remember that everything you see is reversed in the dew drop though so if you want to centre the object that's to the left you need to move it more to the right. Is there any way to create a list of some of the techniques which appeals to me the most, and i may dig it out afterwards, for some knowledge? I found some good tips in areas of photography which i would like to learn, but couldnt read it then. And now i have lost them.